Church members from Boston to the San Francisco Bay are applauding a new teaching tool which allows novices to sound as credible as Ivy League academics. Dubbed “Discovering the Divine Principle, the scripted slide show gets unpacked at nearly every stop of Dr. Michael Balcomb’s preaching tour of the United States, and gets rave reviews every time. 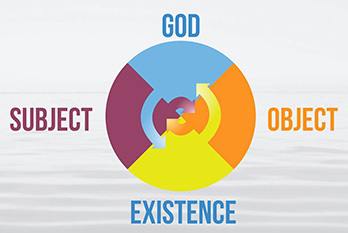 Pictured above is slide one of lecture one of the new Divine Principle lecture series. According to Rev. Compton, designers Jonathan Gullery and LeeHee Wolf have created a new set of PowerPoint slides that are "modern, bright and very attractive." “The tools Dr. Balcomb presented were impressive, and several inexperienced members took turns learning to teach to the rest of the audience. It proved to be a good experience for all who attended, and a lively discussion followed, according to Rev. Michael Hentrich, Colorado State Pastor, after one of these visits. The project began more than a year ago as a brainchild of Rev. Andrew Compton, then the pastor of the West Rock Church in Tarrytown, NY. With the aim of making lectures that were clearer and shorter, Rev. Compton started to design a new series. “I wanted to create something that a new guest, someone who wanted to know what Unificationists believe, could easily digest,” he explained. After a few sessions had been produced, Rev. Compton invited Heather Thalheimer, former director of Education at Unification Church USA, to provide advice for improvements. 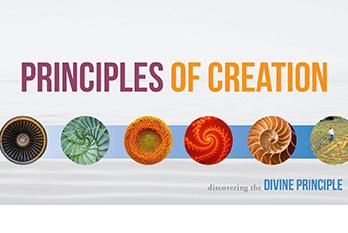 In response, Thalheimer decided to expand the series and assigned Dr. Tyler Hendricks, developer of ministry curriculum, to create a Divine Principle lecture series based on Rev. Compton’s notes. A new project, titled “Discovering the Divine Principle,” began. According to Dr. Hendricks, “The ‘Discovering the Divine Principle’ lecture series was designed to meet a need – to present a style of teaching the Divine Principle in terms that are relatively simple to grasp for the average person – without much religious background, commitment or training.” Thalheimer said the idea to script the content of each of the 12 lectures came about so that even a first-timer could learn and teach “the powerful truth” of the Divine Principle. Pastors Jario and Leena Vincenz-Gavin of Chicago: “Dr. Balcomb took us through a newly created power point presentation of the Divine Principle. In the first 20 minutes he shared the ‘Introduction of the Divine Principle’ as well as part of the ‘Principle of Creation.’ He then shared how well scripted the presentations are and asked for four volunteers to give the next lectures. Two volunteers were second-generation and two were first-generation. Everyone was amazed at the professional quality each of these first time presenters could share. There was no preparation; they simply read the notes as they clicked through the slide show. This presentation is written in such a way that even when read, it sounds very personal. Rev. D. Michael Hentrich, Colorado State Pastor: “With his new approach of teaching the Divine Principle, Dr. Balcomb strove to arm the members, those with and without teaching experience, with the tools and confidence to teach the Divine Principle to guests and contacts in one-on-one settings. Dr. Balcomb demonstrated the ease of effectively using a new PowerPoint presentation, complete with script and powerful graphics.